It's Quick Supper time over at Kitchen Parade, where "quick" means easy on the clock plus easy on the budget, the waistline and the dishwasher. No wonder Quick Suppers are Kitchen Parade favorites! 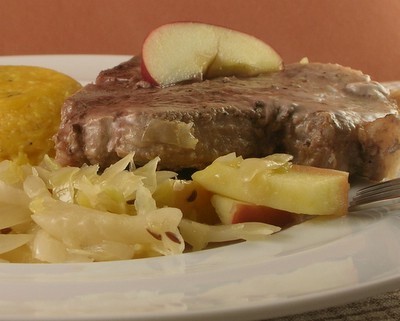 This week's column features juicy, flavorful thick chops tucked into good sauerkraut with onion and apple. Not excited about sauerkraut? You'll still want to check out the pan-frying technique that yields moist and delicious chops. Anyone hungry? Here's the recipe! ♥ Are you looking for Thanksgiving vegetables? A Veggie Venture will publish more Thanksgiving recipes on Monday but til then, check out this great collection. ♥ Welcome to new e-mail subscribers to A Veggie Venture! What is Kitchen Parade, you ask? It's the published newspaper column that my Mom started when I was a baby and that I've been writing since 2002. Kitchen Parade is known for great recipes for all courses, with lots of Quick Suppers, family favorites and kitchen tips plus special sections for Weight Watchers and low carb recipes. If you'd like Kitchen Parade columns and recipes delivered via e-mail straight to your In Box too, just click over to Kitchen Parade, then add your e-mail address to the Never Miss a Recipe box on the right. Or just check out this week's column here; archive columns are online too.